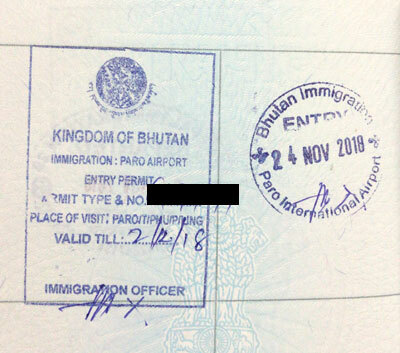 After arriving at Paro airport (PBH) the evening before, the immigration process was easy, having grabbed the default permits in the passport to travel to Phuentsholing, Paro & Thimphu (see image of Bhutan Visa below). 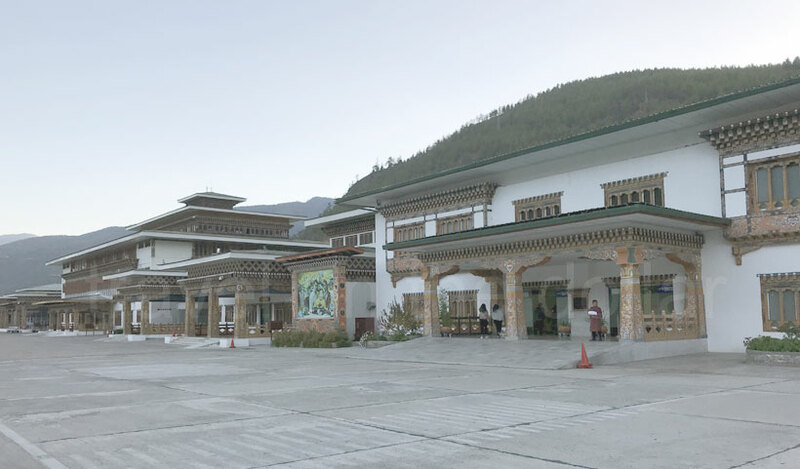 The standard rate of BTN 1600 one-way from Paro airport to Thimphu, is applied to anyone arriving at airport. The only way to travel to either Paro or Thimphu is by a taxi, and taxis are available outside the airport. Multiple forums advice not to exchange currency at the airport because they have the worst exchange rates. Moreover, I was arriving from Nepal via India, so I had enough Indian Rupees (which are accepted along with BTN) to get me by to Thimphu. There are conflicting reports online about what documents are required for Indian/Bangladeshi citizens to secure a permit at the airport on arrival. Some say you need a confirmed hotel booking to get the permit, whereas others say nothing other than your national ID or passport. I was asked to show my hotel booking in Thimphu, and when I presented the paper, the officer didn’t even look at it! I could have given a trash paper and they could have believed it!! But when I asked another officer about this issue, I was told that if you have a confirmed hotel booking then you get the permit for all the days you plan to be in Bhutan, else you get the permit for 5 days only. And you must go to the immigration office in Thimphu to extend your permits. I was given the permits for all the eight days. It takes about 1.5 hours from airport to Thimphu; and it was past 6pm when I was reached my hotel in Thimphu. On my way to Thimphu, I checked with the taxi driver on exchanging USD to BTN; and also getting on a SIM card for my phone. He took me in a store next to my hotel in the main street of Thimphu to have the currency exchanged. If you exchange $100 bills then you get the ‘current’ rate, but if you exchange $20 bills then the rate was terrible! After getting the BTNs, I headed to a local ‘mobile’ store next door for the SIM card. For BTN 730 [230 for SIM and 500 for 5GB data] (approx $10.10), you can purchase a BNT (Bhutan National Telecom) SIM card from any store. The validity is 30 days and you can top-up at most groceries stores around the country. And post check-in to the hotel, I headed for a walk along the main road in center of Thimphu for some dinner at a local restaurant, before heading back to the hotel and calling it a day! 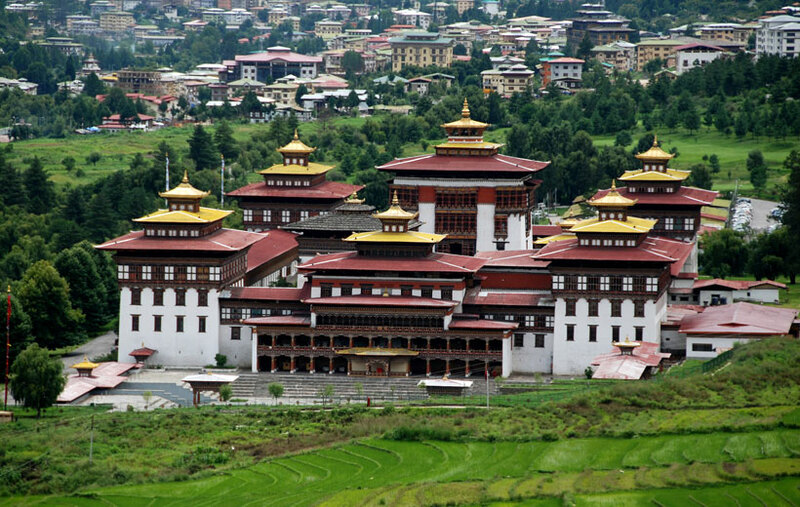 Thimphu is the capital and also the biggest city of Bhutan. 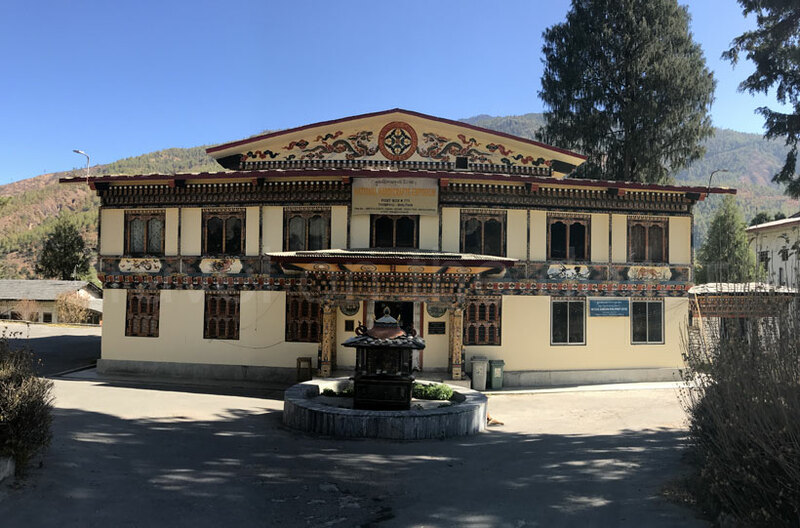 Situated on the bank of River Thimphu Chuu, the city is nestled in a valley with old traditional touch in the north stretching to disciplined high rises as you move to the south. 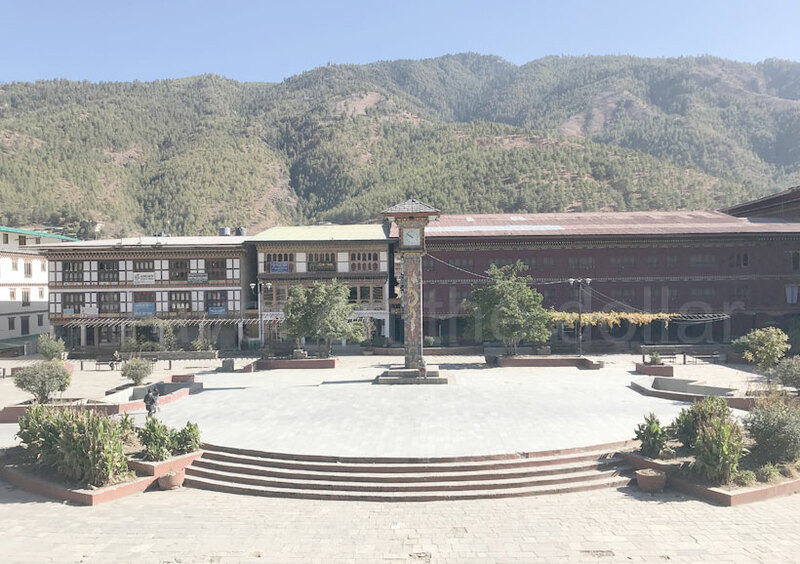 I was staying at Hotel New Grand which is located on the main road Norzim Lam, and right across from the square that hosts the Clock Tower with long dragons facing towards the clock and colorful Bhutanese designs carved onto the surface of the tower. The dragons represent the independence of the dragon kingdom of Bhutan. It is one of the most well-known landmarks in the capital drawing a steady stream of people at all times of the day. 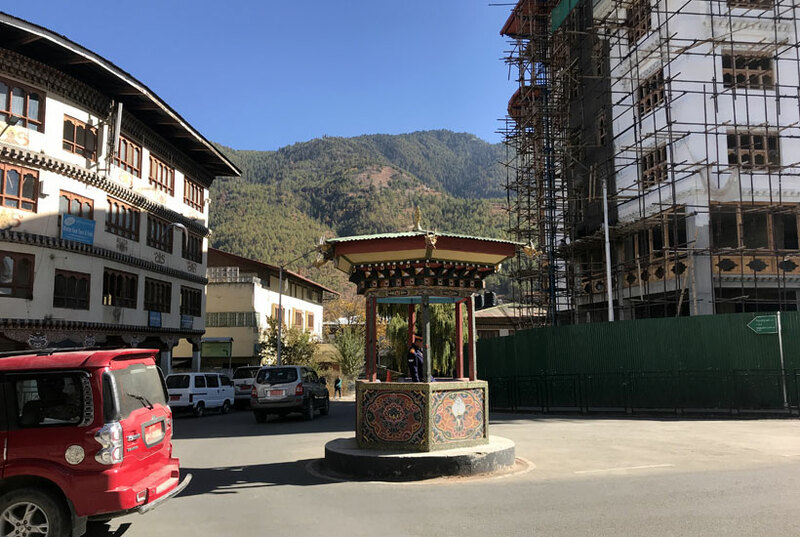 Walk a bit north and you will come across the only manned-‘signal’ in Bhutan – an intersection where a policeman is stationed in the middle of the intersection, directing traffic. Bhutan is a country with no traffic signals at all. Not only that, there are no manned intersections in the country. Sometimes ago, traffic lights were put here but later they were removed. Bhutanese did not find traffic lights in accordance with their culture. Yes, they value their values the most. 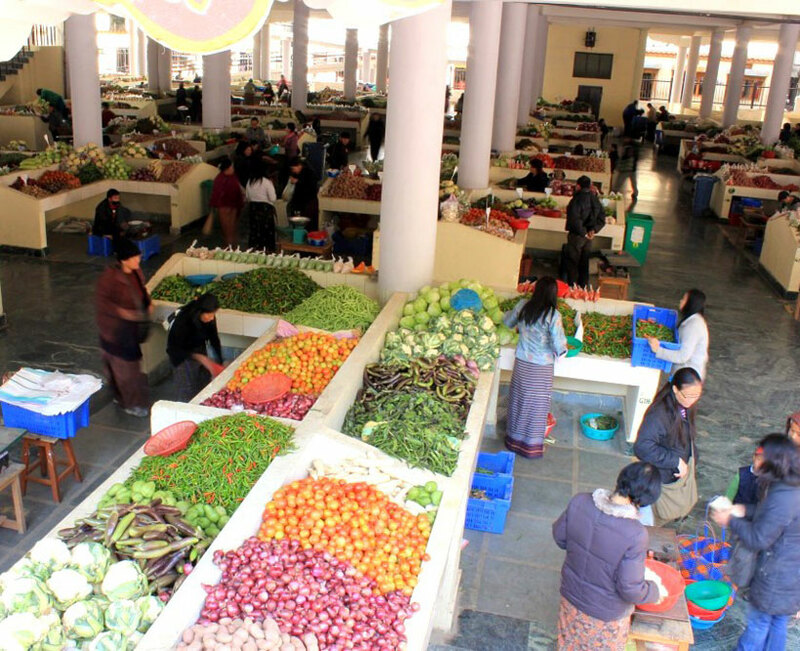 About ten minutes walk from the traffic ‘signal’ is the Centenary Farmer’s Market on the banks of Thimphu Chuu river. Just north of Changlimithang Stadium, this is Thimphu’s busiest domestic market. A two story building with about 400 stalls provides farmers from around the country the opportunity to display their produce and people a chance to support the local agriculture. Vendors from throughout the region starts arriving on Thursday and Friday, and remain till Sunday night. The best time to explore the market is within these three days when the rush of trade is going on. Wander off and in the cereal section of the Farmer’s Market, you will see a display a wide variety of rice: Boyo zaw (puffed rice), zaw (roasted rice), mekhu (Crispy rice crackers), kabchi (roasted, ground wheat), tengma (roasted, flattened maize) and kharang (pounded maize), all an important part of Bhutanese cuisine. The market is open six days of the week, from 7:00AM to 7:00PM except Mondays. From the market, you can cross the bridge over to the other side of the river to see the weekend handicrafts market. This is where the locals setup a market all weekend, and is not impressive as it sounds! I walked back to the city center and took a taxi to Buddha Dordenma statue, located about 7kms south of the city center. Most taxi drivers will charge anything between 1000-1400 BTN for a return trip, and will wait for you there while you visit the monument. But I negotiated the price to BTN 300 one-way, intending to walk back! 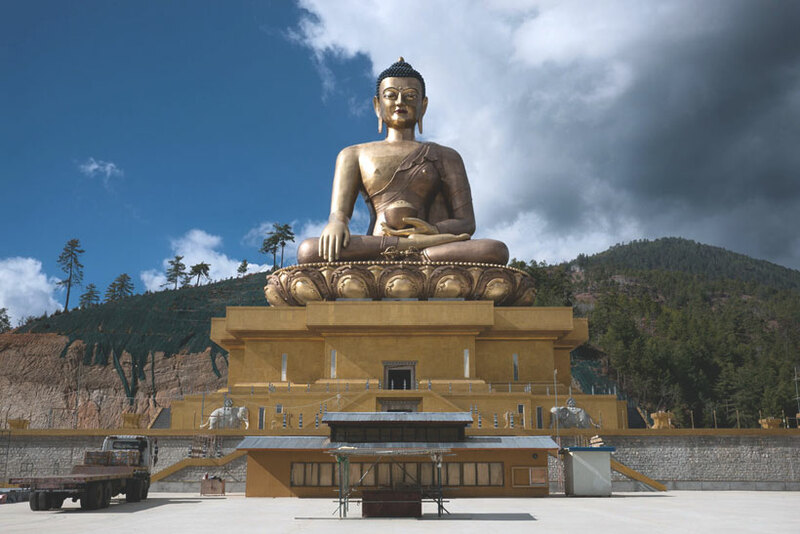 The 169 foot statue stands high on a hilltop and can be seen from any point in Thimphu on a clear day. Inside of Buddha Dordenma statue, there are 125,000 miniature Buddhas encapsulated inside of its enlightened bronze chest, ranging from 8 to 12 inches tall. 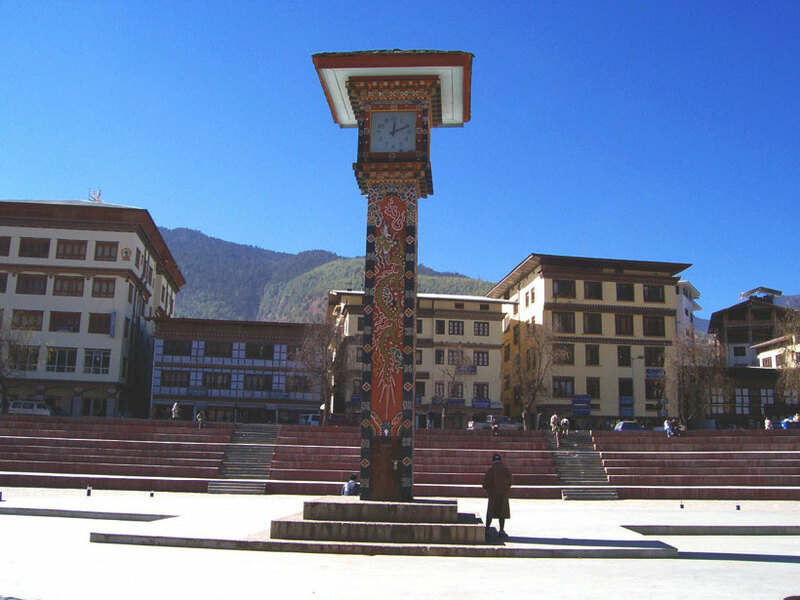 This means that in Thimphu, which has a population of around 100,000, there are more Buddhas than there are human beings. The statue also fulfills two prophecies. The first, foreseen by yogi Sonam Sangpo, is that a Buddhist statue would be built in the region to “bestow blessings, peace, and happiness to the whole world.” In addition, the statue is said to have been mentioned by Guru Padmasambhava, widely referred to as the “second Buddha,” in the eighth century. I was lucky to find a British couple heading back to the city center, who offered a ride to me from Buddha statue to the center! Before heading to the next stop, it was late afternoon, so we decided to stop by at ‘Hotel Ghasel’ for some lunch. Next up on the list of things to see was Tashichho Dzong, located in the north end of the city. 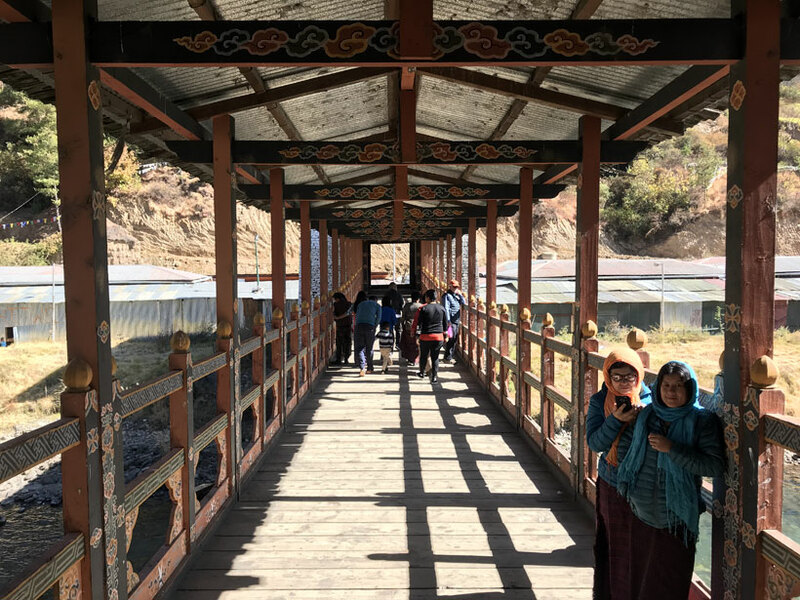 Luckily for me, the British tourists were heading there so I hitched the ride with them to the Dzong (also known as Trashi Chhoe Dzong), which is the seat of Bhutan’s government and National Assembly. 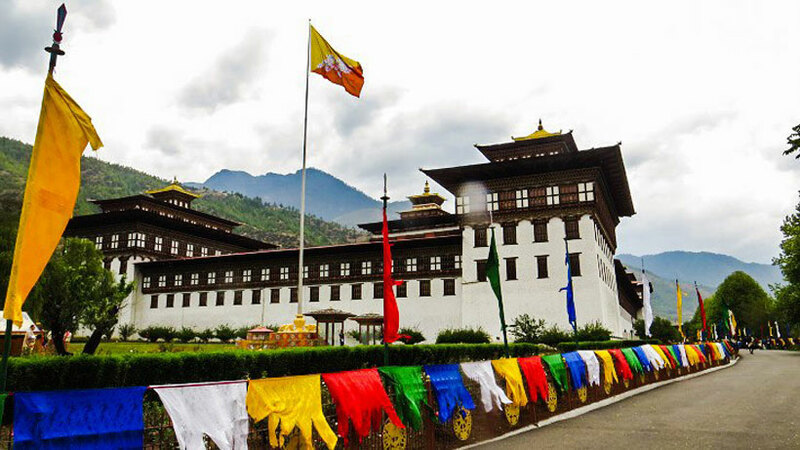 The Royal palace is located across form this Dzong. It was evening by the time I was dropped back to the center at my hotel. And I decided to visit the Memorial Chorten. 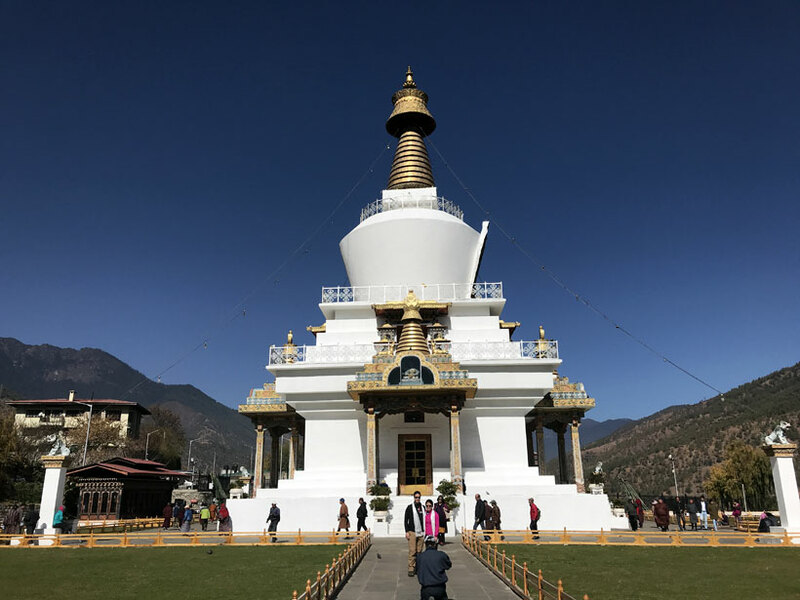 This stupa, which is predominantly white with spires of gold, was built in 1974 in honor of the father of modern Bhutan, the third king of the country, His Majesty Jiqme Dorji Wangchuck. This stupa is unlike others as it does not enshrine human remains. Only the Druk Gyalpo’s photo in a ceremonial dress adorns a hall in the ground floor. When he was alive, Jigme Dorji wanted to build “a chorten to represent the mind of the Buddha” and later after his death late majesty wish was fulfilled by her Queen mother Ashi Phuentsho Choden Wangchuk. Inside you will find mandalas, paintings, statues and shrines dedicated to the king. Large prayer wheels are located to the left. The chorten attracts many elderly Bhutanese on a daily basis who circum-ambulate the chorten, whirl the large red prayer wheels and pray at the shrine. It has four entrances but only one entrance is open for devotees to visit the shrine. Walking back to the hotel, it was past sunset and after dinner at the restaurant of the hotel I was staying at, I stepped out for a walk in the crisp, cold evening of November, before calling it a night. SIM card $10.10 BTN 230 for SIM card & BTN 500 for 5GB data only, valid for 30 days. Taxi from airport to Thimphu $22.53 BTN 1,600. One way. Flag & Postcards $10.91 BTN 500 and BTN 275.